More often than not, characters in movies and TV have an unlimited amount of clothing at their disposal. Their outfits share a common style, and occasionally they mix and match, but for the most part they don’t recycle. Sometimes, though, there are stories that require a character to have some ingenuity when it comes to their clothing. Due to circumstances and key plot points, a character ends up stuck in one outfit throughout almost the entire movie, and finds lots of fresh new ways to wear what they have. I always enjoy watching the creative ways the costume designer has come up with to keep the character (and the audience) from getting bored with the wardrobe. I’d like to share two of my favorite examples of this. 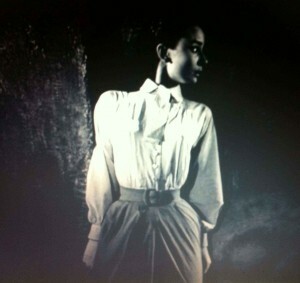 The first involves a fashion icon and a legendary costume designer. 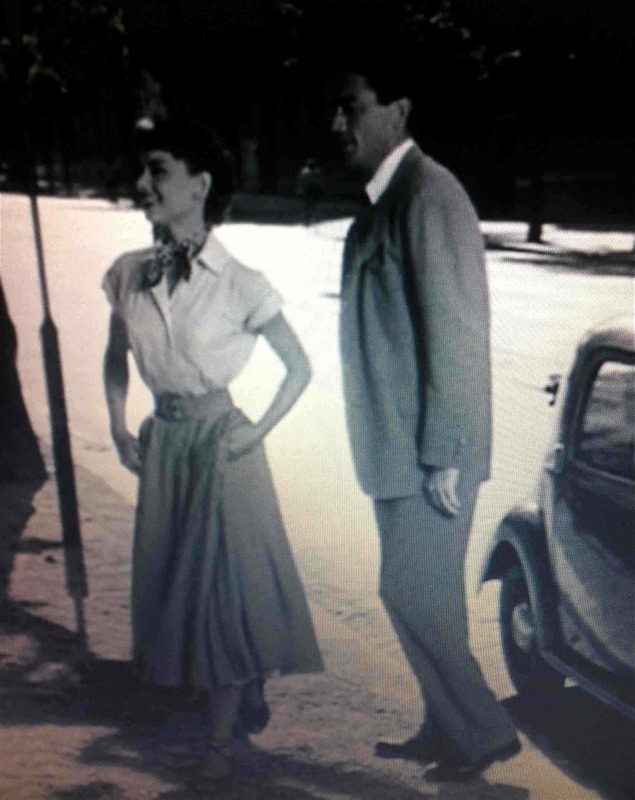 In 1952’s Roman Holiday, Audrey Hepburn’s Princess Ann escapes from her stifling royal duties and spends a day exploring Rome (and finding herself) with reporter Joe Bradley (played by Gregory Peck). When she runs away in the dead of night, costume designer Edith Head has her wearing a simple full skirt, long sleeve blouse, heels and gloves. Throughout the course of her journey, Ann’s outfit evolves along with her. Early on, she trades her heels for a pair of lace-up sandals she buys from a street vendor, which she then pairs with a new, shorter haircut. Her sleeves always fascinate me when I watch. She starts out rolling them up just a little. As the movie progresses, and Ann’s adventures get bigger, her sleeves get shorter, until her blouse looks much more breezy. Eventually she adds a flirty scarf around her neck. As Ann learns to let go and enjoy herself, her outfit loosens up with her, and Audrey Hepburn carries it off beautifully as usual. Another great example is a little more recent, and also revolves around a woman who finds herself on her own in a European city with the unexpected help of a man with ulterior motives. 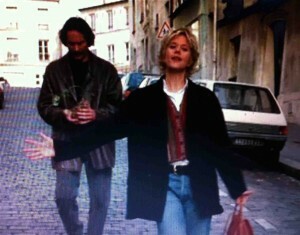 In French Kiss(1995), Meg Ryan’s character, Kate, travels to Paris to win back her fiancé and encounters a series of disasters, including the theft of her luggage. As a result, she is left with only the clothes on her back. Luckily, Kate is wearing several layers! Costume designer Joanna Johnston cleverly uses these layers throughout the film. Like Princess Ann, Kate’s journey through France is one of self-discovery, and again, her clothes reflect her gradual transformation. Kate begins the movie buttoned-up, with a blazer, vest, and a white shirt closed all the way up to her neck. She then mixes and matches these layers, and eventually loosens up quite a bit, throughout the movie. By the time of her train ride to Cannes, she has let go, wearing just her white tank top while regrettably eating a platter of lactose-filled cheese. She then reverts a bit, but not all the way. The white shirt comes back, but we can still see that she has not gone back to the prim, worried, buttoned-up Kate. What always captures my attention when I watch this movie is the fact that she wears her basic 5 pieces in a different way in almost every scene, using just about every possible combination of these items. So next time you’re watching a movie, particularly one where the characters find themselves in unusual or luggage-less situations, take note of the creative use of wardrobe. What are your favorites? *The costume designer for Roman Holiday was Edith Head; French Kiss’s designer was Joanna Johnston. The latest example of this is Bryce Dallas Howard in “Jurassic World.” She starts all composed and buttoned up, then she’s down to her undershirt by the end of the film.